1.Historically there have been seven distinct approaches to ESG investing, implemented in products characterized by inadequate diversification and skewed returns. 2.ESG index providers rely on key performance indicators (KPIs)—quantitative and qualitative metrics that demonstrate a company’s business effectiveness—based on public regulatory filings that often don’t provide enough information to enable advisors to make informed ESG recommendations. 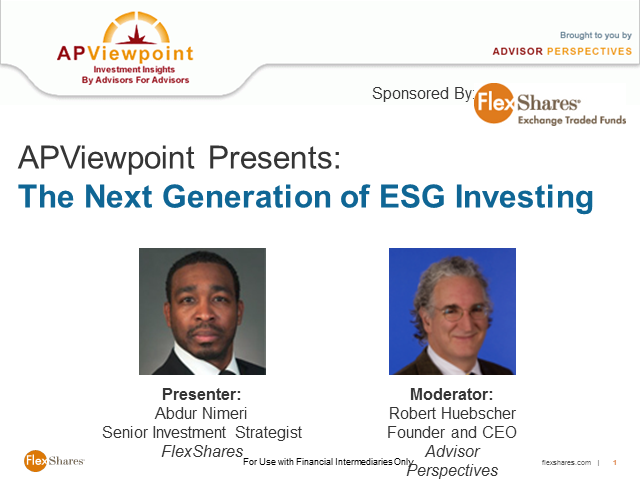 •How multi-category ESG tilts can potentially reduce risk and amplify long-term returns. Abdur will answer attendees’ questions during the webinar and will be available to continue the discussion on APViewpoint. This program is eligible for 1 hour of CE credit for CFP®, CIMA©, CIMC© and CPWA® designees who attend the entire live session.